As an entrepreneur, one of the hardest things to figure out is “What should I work on?” This is also true while working for someone else, but for those of us on our own, it can seem even more daunting. 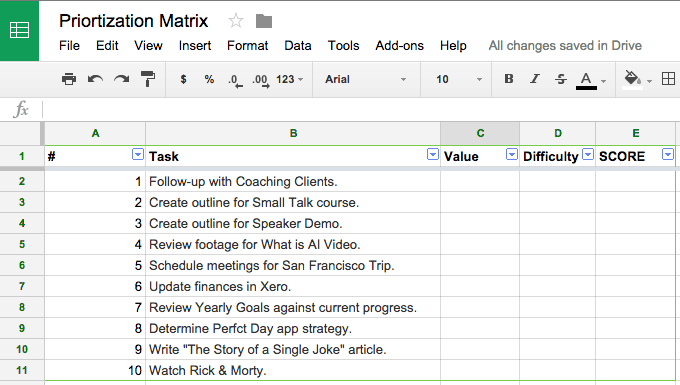 Here’s a quick strategy I use when trying to figure out what to work on; I call it the Prioritization Matrix. Step 1: Create a list. You should already have a task-list of things you want to / could do floating around in Evernote, Trello, or any of the thousands of To-Do list apps. That’s great, but for this exercise, start a new list. Off the top of your head, name 10 things you could be working on. I recommend listing off the top of your head versus reviewing your existing lists because these are the things that are top of mind, and, at least for me, tend to be the things that are most important because I’ve been thinking about them recently. Wow, that’s a lot that I could be doing. All of which (save #10), could contribute to my business in some way. It’s at this point you might start to feel overwhelmed, but worry-not, just move to step 2. Step 2: Assign value to each task. Now, with the list in front of you, assign value from 1-10 (10 being the highest) to each of the tasks you’ve come up with. You have to determine what drives value for you; is it exposure, credibility, money? Hint: as an entrepreneur, money is a good one. As you can see, this isn’t a ranking of the list, so it’s OK if two or more entries have the same value ranking. Now if they all have the same value, you have to be more honest with yourself as to which are truly the most valuable. Step 3: Assign difficulty to each task. The next step is to think about how hard each task is going to be to complete and assign it a number from 1-10 (10 being the hardest). Note that the difficulty assignment should be based on your ability (and motivation) to do it. It doesn’t matter if entering numbers in a spreadsheet is technically easy, if you despise it and find it a challenge for you to complete, then give it a hard ranking. Step 4: Calculate the priority score. Once you have both a Value and Difficulty score for each task, calculate their priority score by dividing the Value by the Difficulty. So, for example, if a task has a Value of 8 and a Difficulty of 4, the Priority score is 2.0. Step 5: Re-order the tasks according to score. The final step is to re-order your list of 10 things to do by Priority Score, with the largest value going up top. Congratulations, that’s the task you should be working on. The value of the Matrix is that it takes a look at both Value and Difficulty. Just because a task is valuable, doesn’t mean it’s the right thing to work on at that time (or for you to do it at all, see below). Just because a task is easy (such as watching Rick and Morty) doesn’t mean it’s where you should focus your efforts. Productivity lies in finding the tasks that are valuable and easy enough to do that you actually do them. Just because something has a score < 1.0 doesn’t mean it’s not worth doing, it just means that it’s harder for you to do than the value you can get out if it. 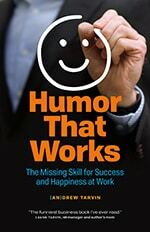 If it’s not a task you’re willing to delete (aka not do at all), it means it’s a perfect task to consider outsourcing or delegating to someone else. For example, determining my Perfct Day app strategy is very valuable, but it’s hard for me to decide. So I’m going to request assistance from some smart friends to help me figure it out. This is just one way to think about the work you need to do. If through this exercise you realize you really want to work on Task #2 instead of #1, great, do that. That you do something is better than what you do. I hope that helps you with the prioritization process. 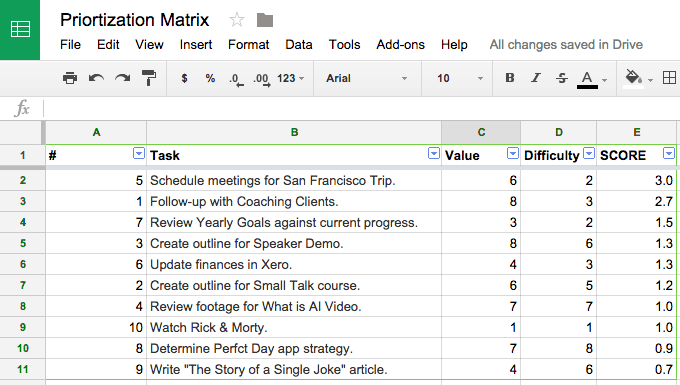 You can find an example copy of the spreadsheet I used here: Prioritization Matrix Example. Share any feedback or questions in the comments.